Cool Gift Suggestions for that hard-to-please GSD dog lover! Happy Holidays Everyone! Whether it's a unique present for that hard-to-please person, or a gift for a special someone these cool GSD gifts are sure to please. I’ve worked my paws off over the past few days, updating my own personal wish list with all the latest interesting dog related gifts. German Shepherd Jewelry Keeps Your Best Friend Close! Exclusive Heart Shaped Pendant - Dog Themed Jewelry You'll Cherish! - From the first tail-wag, your German Shepherd has wiggled his (or her) way straight into your home and heart - to stay! Now you can pay tribute to your special friend with this beautiful heart shaped pendant, crafted of fine sterling silver and finished in 24K gold. It features a fine porcelain inlay with a true-to-life portrait of your furry pal, plus two engraved paw prints!On the back of this sweet sterling silver pendant jewelry, you'll find more engraved paw prints, and the sentiment, " German Shepherds leave paw prints on our hearts." This exclusive dog themed jewelry from The Bradford Exchange is the perfect way to keep your German Shepherd close to your heart, and it makes a "doggone" terrific dog lover gift, too - order now! Linda Picken's German Shepherd Collector Plate! Fine Porcelain, 22K Gold Rim, a Limited Edition Exclusive! - No dog works harder, in the line of duty or simply to win your heart. The German Shepherd with its strength, endurance and intelligence is a breed apart. But most German Shepherd owners simply know this very special dog for its loving and loyal nature. Now renowned artist Linda Picken captures this intelligent breed's many winning ways, presented on fine porcelain and banded in 22K gold.This Bradford Exchange collector plate shows off the best qualities of German Shepherds, from cuddly pup to faithful companion. An exclusive limited-edition you won't want to miss, order now! Linda Picken's German Shepherd Collector Plate. "Stone" Texture Imprinted with Paw Prints, Loving Verse, a Limited Edition! - An intelligent and able working dog, the German shepherd's very favorite role is simply loyal and loving best friend. Now, acclaimed wildlife artist and friend to animals Linda Picken captures the spirit of this beautiful breed with this touching tribute fit for the hero of your heart.The stone-finish presentation with paw prints and sentiment remind us of the enduring impression this dear companion leaves on our lives. An exclusive Bradford Exchange collector plates limited edition. Demand is strong - order now! Help support our site by making a purchase from us if you are in the market for German Shepherd related items. They make great gifts! We have a wide range of products from the finest of dog collectibles to things you use everyday, like regular checks, and everything in between. Thanks for browsing. Any of these items would be wonderful gifts for any German Shepherd lover or owner. And with Christmas coming up really soon, these German Shepherd collectibles would make the best gifts possible. Here you can select from puzzles, frames, tote bags, doormats, throws and much more. Each of our metal signs are handmade, one at a time. These metal dog signs are great for outdoor use in any weather conditions (and for indoor use as well) and they are very sturdy and last a really long time too! 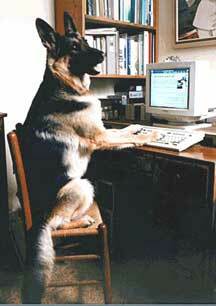 We have decided to add new and exciting ebay German Shepherd auction items to our site. Now you can browse through the menu of items presented here to find the perfect GSD product you are looking for - then, just click on the item to bid right away! This store is continuously changing so visit often. The holiday season is right around the corner. Do you need a gift for the German Shepherd lover in your life? German Shepherd Dog calendars are always a cherished and desired year-long gift. I hope these gift ideas are helpful to you. If you see anything you like just click on the link and you should be able to order right there on the spot. Quick and painless shopping, especially with Christmas holidays so close. If you have any questions or comments about anything on our website, new ideas for content or things you'd like to see appear, please let us know - we'd enjoy hearing from you. Happiest of holidays!